A friend of mine introduced me to this interesting exhibition by the Kyoto Textile Fabrics Wholesaler’s Association which just had their 50th Anniversary. Luckily I had time to check it out before heading back to Tokyo. This exhibition was beautifully curated and showcasing the evolution of the Japanese garments until today. Photos were allowed – so let me take you on a quick tour with me! The Nara period lasted from AD 710-794. Looking at the garments you can see strong influences from China. Tight sleeves and a layered garment on top of trousers or skirts, tied with a long sash. The kimono as we know it today was born much later. Unfortunately there isn’t much knowledge of what the common people were wearing at the time. Education as well as art was only accessible to the higher class, so were silk garments. 1185 to 1333 marks the time of the Kamakura period and the rise of the samurai and commoner classes, simplifying and making garments accessible to more people. The “kosode” (close to todays kimono) which was priorly worn as an undergarment, was turned into an outside layer of outfit. When traveling, the women of the samurai class would not display their face in public, thus covering herself with a large straw hat and veil (called “ichime-gasa”). Towards the end of this period, women of the court or military class would start to wear the “hakama” kimono trousers. In the beginning of Muromachi period (1336 – 1573) wealthier women would dress themselves in “Kosode”. For formal occasions an uchikake kimono (today mainly used for weddings) would be worn, whilst the commoner dressed in a kind of long kimono jacket. 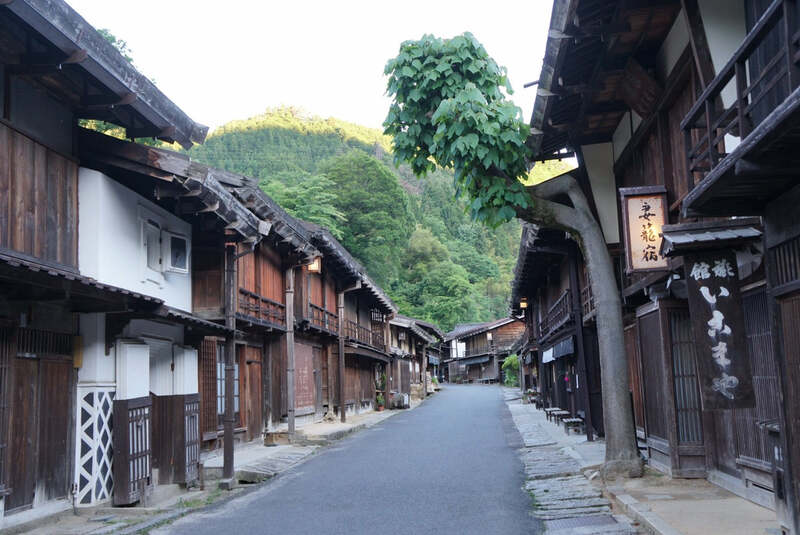 During the Muromachi the arts and craftsmanship further developed and trade with Europe started. By the end of this period, all commoners were able to wear kosode. As you can see they layered and loosely tied, revealing the lining. At this point there was no “miatsuguchi” aka. the under arm opening women’s kimono have today. The Azuchi-Momoyama period did not last too long (1568 – 1603) but brought great changes. Land owners and commoners started to become wealthier and the time without wars allowed for the textile industry to evolve. As new dyeing and weaving techniques were discovered, the kosode was perfected in its details and creativity. Nishijin-weaving was established and as you can see above – breathtaking embroidery artworks started to decorate the garment. The Edo period (1603 – 1868) is often divided in early and late stage, since there were a lot of developments in lifestyle and on the kimono topic. Above you can see festival outfits from the early Edo period. Can you see the change to todays kimono silhouette? During the late Edo period, Yuzen dyeing (elaborate hand painting on silk) was developed, allowing for more complex kimono designs. Inspired by the art of kabuki and the actors always wearing the newest designs, kimono became more and more fashionable. Those who could afford, would show off their wealth with kimono. The sleeves got longer, the obi belt wider – making it impossible to tie the garment by oneself. Unhappy about the merchant class becoming a powerful threat, the shogunate started to prohibit fancy attire and ordered the people to tone down their appearance. Based on rank, age, gender and occasion, strict rules were enforced onto the kimono world. (The start of many of todays kimono rules.) Most of the commoners kimono were dark blue, brown or black. The Meiji period (1868 – 1912) and Taisho period (1912 – 1926) brought drastic changes into the wardrobes and lives of Japanese. The opening of Japan and the request to wear western clothing was the beginning of the kimono to slowly vanish from our daily lives. But also it was a time where colorful kimono made a comeback! And I’m not going to lie – personally I am a big fan of the taisho era and the mix with western hair styles and accessories. In fact the exhibition had more gorgeous pieces on display, but some were from personal collectors and not allowed to be photographed. The exhibition skipped on the more recent kimono, probably since there hasn’t been much new development in the shape / craft of kimono. Actually there has been a decline of the old craft as we all know. But we got blessed with new technologies e.g. such as digital print, with what we can make many fun kimono designs easily. In the exhibit the designer Yuima Nakazato was showcased with his designs inspired by the boro patchwork fabric. I really loved the exhibition – especially because we don’t have many chances to see the attire and way of dressing from the old times. In the past centuries the emphasis and rules of kimono have been rather strict, asking for a perfect dressing without a fold. I think it is important to remind ourselves that kimono used to be a loosely worn piece of every day clothing to live in. I do like the modern way of “kitsuke” aka kimono dressing, however I wish that we can losen up a little again and live again in kimono. Also I met the curator of this exhibition, who was lovely enough to have a short chat with me. FYI a woman with a fashion studies background curated this well put together event.